This month in the UK belongs to the sky. BBC Stargazing Live, which airs on Monday 16th at 20:30 and at 20:00 on Tuesday 17th and Wednesday 18th, has sparked a number of events all over Great Britain. On Wednesday 18th live on air all the lights in the town of Dulverton, Somerset will be turned off in an attempt to become the first town to turn all of its lights off simultaneously. This is all part of Stargazing Lives’ aim to showcase the beauty of the night sky without air pollution. All 117 streetlights in the town will be switched off, along with every light in all residences, at around 20:15 on Wednesday night at the sound of the Church bells. The switching off of the Dulverton lights will round off a three night spectacular, where the stargazing live team (headed by presenters Dara O’Briain and Prof. Brian Cox) will switch off the lights of many well-known landmarks, Like the Eden Project in Cornwall, to show the magic the sky has without the effects of light pollution. As part of Exeter Universities Astrophysics department outreach, a number of colleagues and I, lead by Dr Jenny Hatchell will be taking part in events over the three days and around Exeter in February. Over the three live events and throughout the month amateur astronomers, stargazers and novices will be welcomes to ‘star parties’ all over the country. Check out events near you on their website bbc.co.uk/stargazing. 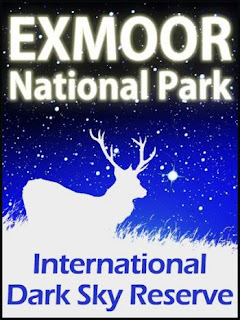 Also check out Exmoor National Parks website for some stargazing information http://www.exmoor-nationalpark.gov.uk/visiting/things-to-do/stargazing. Jan 17th (17:00 – 20:30): Dunster Tithe Barn, Exmoor National Park, public event. questions with the experts, as well as a from Earth to the Universe exhibit. hands on activities showcased by Exeter Universities Astrophysics department. (Both these events are expected to attract a large number of amateurs and all who wish to attend are more than welcome). Feb 10th (18:30-20:00): St Luke’s Science and Sports College, Exeter are hosting an evening with the stars. The event is open to the community as well as school students with the astronomy club holding rocket building competition as well as opportunities to visit their ‘Space Odyssey’ mobile planetarium. A number of Astrophysicists from the University will also be there to give presentations and answer any questions.